Free download Top Player’s Golf game for PC. It was developed for Neo Geo platform by SNK. It is the golf game for golf lovers and players. Top Player’s Golf is very easy to play. 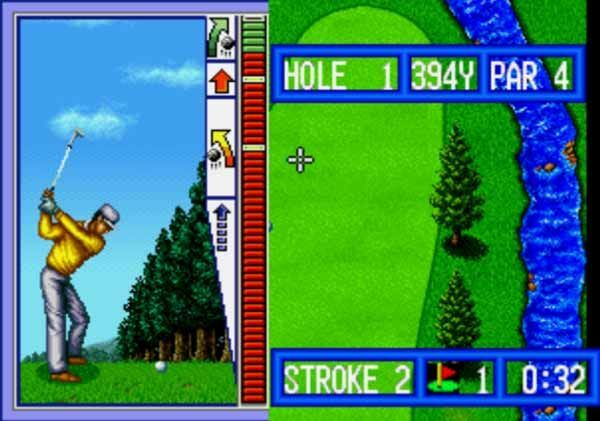 You can play this golf game on your system by downloading the file. The game has three modes that are Stroke Play, Match Play and Nassau Game. Stroke Play is for single player. You can play this mode for your practice and make your game perfect. Match Play and Nassau Game is for vs match. You will play with computer in these modes. Nassau game mode has an option of Out and In selection of the game. When you chose Stroke Play, you are asked to select the player from David, Masashi, Hubert and Jack. After selecting your player, you need to select the golf course from Top Player’s Country Club and SNK Championship Golf Course. Top Player’s Country Club will take you to the respective golf course. You need to remember the map of the golf course for better. In the image given below, you can see your starting point at the bottom. While at the top, there is green, the destination of your ball. When the game starts, you will see the shot, course, Club options. Shot is used to hit while club option is used to change your club according the distance from green. At the start, always use 1W to hit the ball for 250 Yards away. You will see two cross marks. Red mark shows your ball location while white mark is the direction of the hit. After selecting the Shot, you will see the ball in “Zoom In” mode. The bar will show the distance of your hit. At the start, try to take the red bar at the top. Try to make as less shot as you can. If your shots are less than your opponent then you will win. Try the game now and enjoy.